Just a quick recipe post since I finally got spelt crust to work the way I wanted last night! The result was a rather epic pizza. 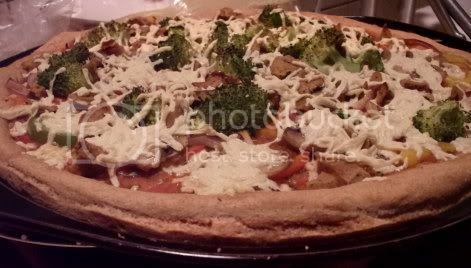 Faux sausage, three colors of bell pepper, red onion, white mushrooms, broccoli, and mozzarella-style Daiya…on spelt crust. I’ve been a fan of spelt ever since making Homey Vegetable Stew with Dumplings from The 30-Minute Vegan, which uses spelt flour for the dumplings. I like the texture and I think it lends itself well to biscuits and crusts. 1) In a large mixing bowl, stir together water and yeast until the yeast is dissolved. 2) Add the sugar and salt, then stir in the flour to form a dough. Add more water if the dough is too dry or more flour if it’s too sticky. It should be slightly tacky to the touch, but shouldn’t stick to your fingers. 3) Knead the dough in the bowl until it’s smooth and springs back a bit when you press your fingers into it. Form the dough into a ball and take it out of the bowl. 4) Lightly oil the bowl with some olive oil and replace the dough. Cover with a cloth or dish towel and place in a warm spot until doubled in size, about 1 hour. 5) When you’re ready to use it, punch the dough down and proceed with whatever recipe you like! 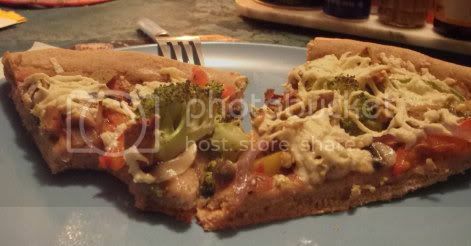 This dough can be used wherever regular pizza dough is called for.